Halloween celebrating in Pittsburgh begins long before the 31st rolls around. Here’s your guide to the spooky parties happening all over town. Celebrate every Hump Day in October with things that go bump in the night! Trax Farms hosts evening hayrides for grownups on Wednesdays from 4:30 to 7 p.m. Purchase a pick-your-own-six-pack at the on-site bottle shop and (ironically) hop on the wagon. There also will be a beer sampling, corn maze and bonfire to complete your ideal autumn evening. 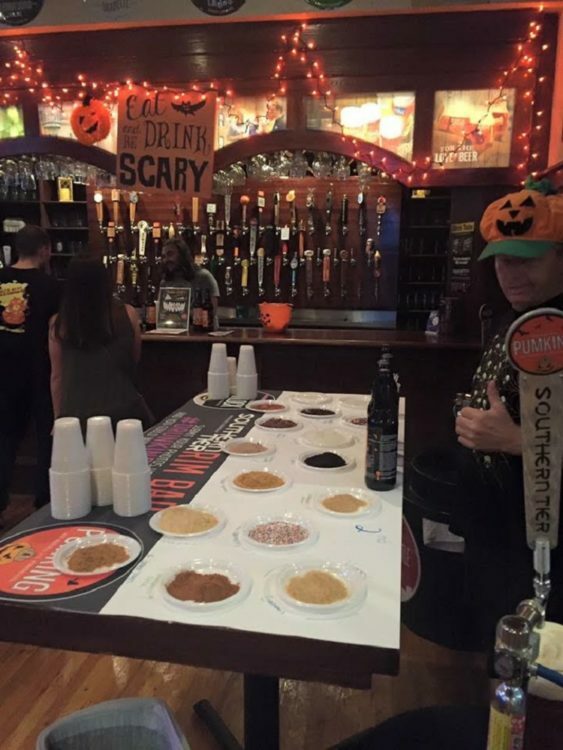 At Hough’s Drunkin Punkin Fest, you can rim your glass with a “wet” ingredient (marshmallow fluff, raspberry syrup, caramel) and then add the “dry” (graham crackers, cookie crumbles, cinnamon, sugar). Each fall, pumpkin spice tantalizes taste buds and nostrils with its magical flavor and aroma. Let your liver get in on the action at the Drunkin Punkin Festival at Hough’s in Greenfield. This yearly “brew”haha — which has three sessions from 11:30 a.m. to 2:30 p.m., 3:30 to 6:30 p.m. and 7:30 to 10:30 p.m. — will be held on Oct. 6. It features an array of pumpkin beers, Halloween snacks, an official Drunkin Punkin can koozie and a rim bar that’ll let you add a little extra sweetness to your tasting glass! Forget fun-sized candy bars, TBSP puts the real treat in trick-or-treat! On Thursday, Oct. 11 from 6 to 8 p.m., the bakery incubator is pairing with Canonsburg-based Rusty Gold Brewing for a night of pastries and pints. Guests will enjoy local brews and bites, including cupcakes they can decorate themselves. Beware: that sweet tooth might just get you one monster dental bill. George A. Romero put Pittsburgh on the cinematic map with 1968’s “Night of the Living Dead.” Celebrate his contributions to the city at the Carnegie Science Center’s 21+ Night: Romero Lives on Oct. 12 from 6 to 10 p.m. The adults-only brain bash includes a screening of “Creepshow,” Romero’s collaboration with Stephen King, lectures, zombie-themed drink samples, special makeup effects demonstrations, karaoke, music, Scarehouse zombies hosting a homecoming dance, a costume contest and other tricks and treats! Oh my gourd! At Pumpkinfest, you can chug seasonal beers straight out of autumn’s favorite sacrificial squash! The event, sponsored by Blue Dust gastropub, will take place on Saturday, Oct. 13 from 1 to 10 p.m. under the Homestead Grays Bridge. In addition to jack-o-lantern-inspired libations, there will be food trucks and live music from The House of Soul Band, Elias Khouri and more. Witness a live podcast recording on Oct. 14 as local historians and Halloween aficionados John Schalcosky (The Odd, Mysterious & Fascinating History of Pittsburgh) and Marta Anyse Napoleone (Marta On The Move) share the Steel City’s spookiest tales. The annual event will be held in a bigger venue this year to accommodate more ghost buffs, and Pittsburghers are encouraged to submit their own macabre memories to martaonthemovepodcast@gmail.com or oddpittsburgh@gmail.com. The show starts at 6:30 and admission includes free craft beer from Helicon Brewing. The post Your Halloween party guide for Pittsburgh: The fun starts this week appeared first on NEXTpittsburgh.